is perfect - at the center of it all. Other features included a small touches that makes a huge difference - use of a laptop with unlimited high speed internet access with the WiFi, multi-languages satelite LCD TV, electrical kettle, well-stocked bathroom with hair dryer, aircon room, design linen, four pillows, extra blankets, local artwork, etc. 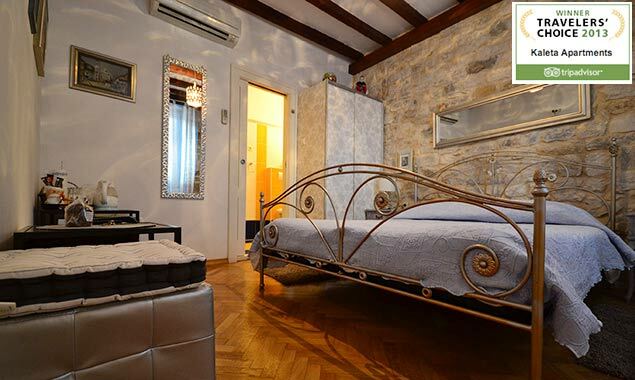 "BRILLIANT APARTMENT WTHIN THE CITY WALLS"
My partner and I stayed at Kaleta from London for 3 nights in September. Niko met us at the bus station and escorted us back to the apartment. We couldn't have asked for a better location with restaurants and all sights were literally on our doorstep. 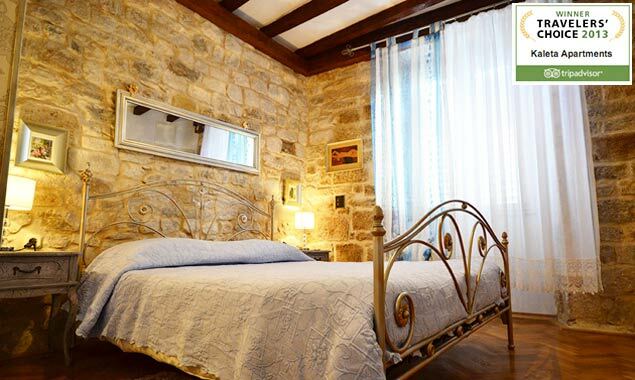 Double glazing on the windows ensured a good nights sleep despite being right in the heart of Split. Free internet access was provided in the room. The coffee in Cafe Teak downstairs was fantastic too. My wife and I stayed at the Kaleta Apartments for 2 nights on our vacation in Croatia. The room was very nice and included free Wi-fi and laptop computer that made it easy to communicate with family and friends and monitor myfantasy football team ;-) The windows do a good job of keeping out the sound of the bars on either side of the apartment. It was sure nice to be so close to a cup of coffee or a glass of beer. The only down side is finding parking if you have a car. Our host met us and helped us to our apartment but we had to park about 1/2 mile away but for free. We got lost many times and couldn't always find our apartment but this was just part of the fun. We had a wonderful day in Split and having a nice apartment in the middle of Old Town made it easy to take breaks or freshen up during the course of the day. 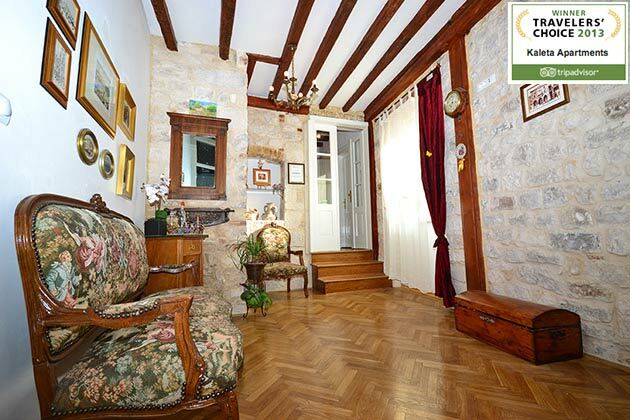 Perfect location inside the walls of the palace, walking distance from ferry and beach. Very very clean, heaps of character, modern bathroom, very friendly and helpful owner. Can't imagine a better location or accommodation within the walls of the palace! Stayed here in the height of summer and was very impressed. Very accessible either by private or public transport as though it is located in the maze-like old town, parking is easy just outside the walls. Location-wise it doesn't get any better than here if you want to explore the city. 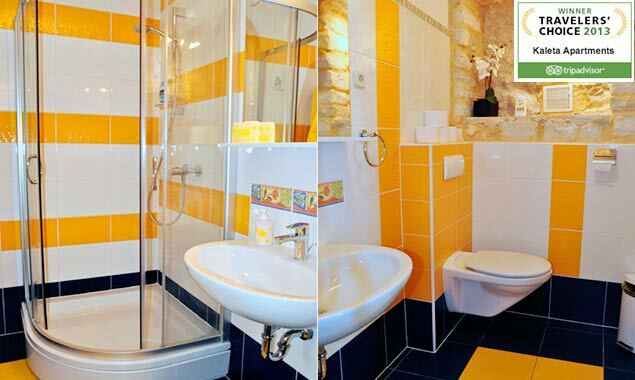 Clean comfortable facilities with nice extra touches like the very decent shower and wifi. Bars and a few very good restaurants can be found literally on your doorstep which can be a mixed blessing. Great for staying out late drinking but not too great when nursing a hangover the next morning. The throng of tourists and locals alike inevitably produce enough noise to annoy sensitive souls. The double glazed windows go a long way to mute these irritations nevertheless. Highly recommendable throughout. I totally recommend. Stayed in apartment 2. Room was very clean and very comfortable. It had a very remodeled feel, with really nice modern floors, furtniture, and appliances. The nicest and least expensive place we stayed while in Croatia. The bathroom was very modern and the shower was better than mine at home. They stocked the kitchnette with tea, coffee, and biscuits. Also had to love the free internet & computer in our room so we could keep our friends/family up to date with our adventures! Service was adequate. Like most sobe and apartments, the owner shows you the basics and then leaves you on your own to enjoy yourself. Very private and we felt secure leaving our stuff in the room. We stayed for 3 nights and were very pleased with the apartment. 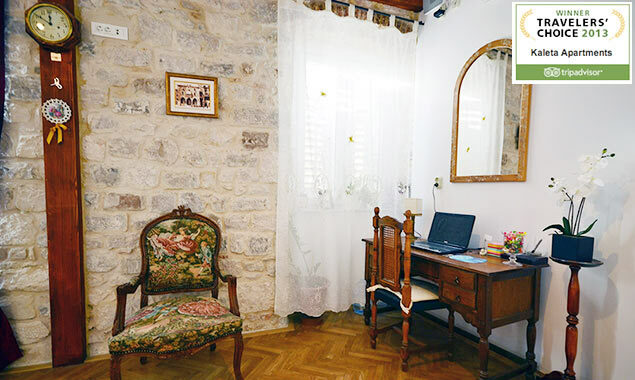 Although the studio was a little small, the excellent location (within the walls of the Diocletian Palace itself), friendly owner and clean studio was great value for money. The studio was so well-equipped, it even had a laptop with internet connection! The busy bars and restaurants below the studio were no problem at all as once the shutters and windows were closed, we couldn't hear any noise from the outside. Highly recommended! We recently went on holiday to Croatia and finished our trip in Split staying in Kaleta Apartments. I don't usually write reviews, but this place was fantastic. The apartment had everything and more and the location was absolutely brilliant, as was the owner. Luggage storage was also no problem the next day. We found this place through reviews overs had written and felt compelled to write own for others to read. Top marks for a brilliant place!! I don't have enough words to describe how awesome of a time we had on our vacation to Croatia and I believe we owe most of that to the Raic family and their accomodations!. The airline lost our luggage after a long journey to get to Split and the only thing we wanted at that time was a clean room room with a comfortable bed. We were so pleasantly surprised when we saw the room, with it's exposed brick, massage shower, computer with internet (very rare in Croatia sobe accomodations!) and great location, we couldn't have asked for anything more. In addition to the fabulous accomodations, the family was nothing but helpful in trying to get our luggage tracked down. What could have been a tedious process making multiple phone calls from pay phones, their son allowed us access to his phone and we received our luggage the next day. The cafe outside is adorable, as well. If you stay in Split, you MUST stay here- we had absolutely no complaints. Together with another couple we took the two apartments for two nights. We had been sailing together around Split and as soon as we arrived back in the marina we telephoned to say if we could check in. There were no problems and our taxi driver then offered to phone the owners while we were in the cab to get instructions on where to park the car. By the time we were at the Golden Gate the owner was there waiting to help us with our luggage and show us the way to the apartments. (The taxi driver came too to help and offered to return to take us to the airport later!). The owner and his wife showed us how everything worked and gave us great advice about choosing restaurants. On the day of checkout they looked after our luggage until we needed to leave for the airport and were even on hand to help carry them down the stairs. The apartments are very comfortable and clean, and although they can be noisy with the buzz of the cafes below, all the windows have wooden shutters that close tightly. The apartments are air conditioned and we found that the cafes below closed around midnight and didn't open until 10am. The absolutely unique position of the apartments, their charm, and the warmth and exceptional helpfulness of the owners made our stay in Split really delightful. 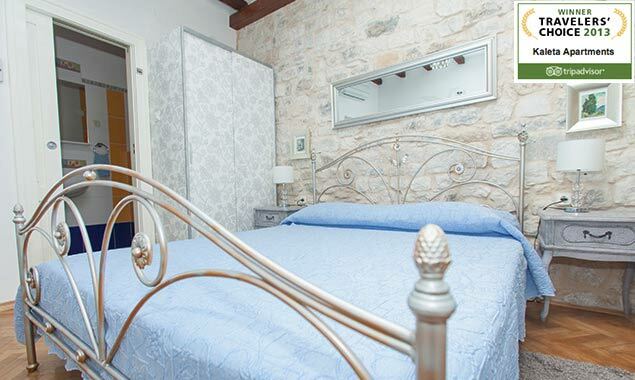 Split is a wonderful holiday destination and the Kaleta apartments is the place to stay. "VERY COMFORTABLE STUDIO FLAT INSIDE THE PALACE LIMITS"
The best location -by the Golden Gate - right in amongst the Roman remains. The studio flat is extremely nicely furnished with everything you could need. The shower is a (good) surprise. A big bowl of cherries awaited us in the fridge and it is no distance to the fruit market and fish market , food shops, restaurants and all the sights. The rooms are above a couple of bars and it was Saturday night. As the son of the owner told us in his flawless English - you shut the windows and the shutters and it is completely silent. This proved to be true. You do have to turn on the air conditioning but it is new and quiet.....Highly recommend it. (Make sure you have the phone number with you as you may need it to rendez vous with the owner. "GREAT APARTMENT IN THE CENTER OF THE PALACE"
We called when arrived into Split and was meet within minutes and shown where to park for free.Great apartment with computer and free internet service.The apartment is clean and new with wonderful sound proof windows and shutters.Great shower too. Don't hesitate to book here. You won't be disappointed! Although this was a gem, there are a few things one should be aware of. The owner doesn't live there, so you must contact her in advance if you want her to meet you at the apartment otherwise be prepared to wait when you get there. Because the apartment is within the palace walls, we had trouble finding it and parking was difficult/expensive.